First off, this is a GREAT product. Just installed two units on the roof beams of my peaked garage. The bikes squeeze up between the rafters leaving about 8 feet of headroom. CAUTION-when attaching the two plates parallel to the beam the center line axis of the plate wants to lay flush against the wood. I'd suggest you drill 3/8" diameter relief holes in the beam above the plates for the bolt nuts that hold the pulley's to the plates or you will bend the plate when tightening the mounting screws (which run down the central axis of the plate). Also use a screw eye to knot off the end rather than put a knot above the plate (which would require another clearance hole). I needed more than the 48' of the 1/4 " dia. cord supplied but that looked pretty ratty anyway so I replaced it. Finally take into account an additional 12 inches of headroom for the plates and bike holding hooks. 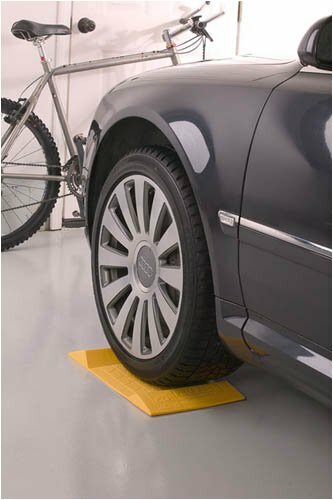 A great, economical, easy to install, easy to use bike storage system. I bought 3 and are all well worth the money. I had a problem at first with two of them, but received EXCELLENT customer service from Racor directly, and the problem has been elimiated. It was a actually a pleasure to deal with a manufacturer who takes pride in their product and service. 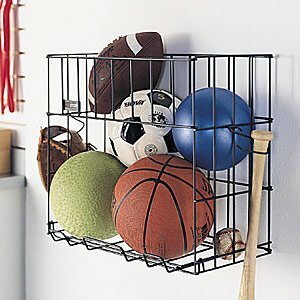 I recommend these to anyone looking to free up some garage space. This is a good quality product and an excellent company to buy from. Packaging was professional and shipment was very timely. They went out of their way to e-mail me a letter to better explain how to determine the distance between studs in our finished garage, easier ways to install the hoists along with a picture that is more explanatory and even to say if the two hoist don't work for us, directions on how to return. I give them thumbs up. Not to forget the hoist. I love the extra room that was made possible by hoisting the bicycles up to the ceiling in our garage. Nothing like getting them out of the way! They lock into place right at the top of the ceiling and getting them up was not that difficult. I was able to do it by myself. I just mounted my first bike hoist. It works great. I have a 20 ft ceiling in my garage and needed something to use that space. This fits the bill. The only alteration I needed to make was to buy 100 ft of rope. 1/4 inch clothesline rope seems to do the trick. I'm online now to buy 5 more. We shopped other locations, including various bike stores, auto part stores and garage stores. The 39.99 price was the lowest. With free shipping on Amazon.com, it can't be beat. Great for the bikes and space-saving too! This rack seems like it'd be a good idea. I bought it to free up some space inside my apartment. However, when I received the rack, I was unable to fit the pieces together. I called the customer support people at Racor and they were very friendly. They are going to ship out a new piece for the middle which should fit. If this works, it'll be a nice rack. Mine's not scraped up like the other reviews. However, I have yet to see if this will work. Only holds one bike, doesn't stand up straight. 1. The packaging was poor and the base was badly scratched when I received it. 2. I'm 6'2" and I have two tall bikes. The rack is too short for both of them. With the top bracket at the highest setting, the bottom bike won't fit below it. I paid a welder $30 to change the angle of the top bracket so that it goes up 45 degrees. Now there is room for the second bike. Now the rack costs $80. 3. The joints in the rack are wobbly, so my rack tilts to the right about 5 degrees. I think it's ugly. I'm going to screw the top of the rack into the wall to fix this. That kinda defeats the purpose of a "gravity" rack. Now that I've got it fixed up, it does what it's supposed to. Kind of a pain but it works, and it's still pretty cheap at $80. like other reviewers my box arrived a bit beat up, i was half expecting to find parts missing. unlike others i had no problem assembling it and it seems very sturdy. for the price you aren't going to find a better deal. i've got way too many bikes in too small of an apartment. the lower half seems a bit useless (all my bikes are pretty big though). it's not tall enough to get the bottom bike off the floor so you can't store anything there. i'm thinking about removing the lower arms and just leaning a couple of bikes there. it's already getting my apartment into shape. I've been wanting a bike rack like this for years. I've tried products that seemed similar, and they just didn't work for me. This one's exactly what I was looking for. The rack arrived with no scratches. This was a surprise, given that two of the sections that make up the vertical post were loose in the manufacturer's box, and the box was a bit battered. The rack itself looks great in my garage. 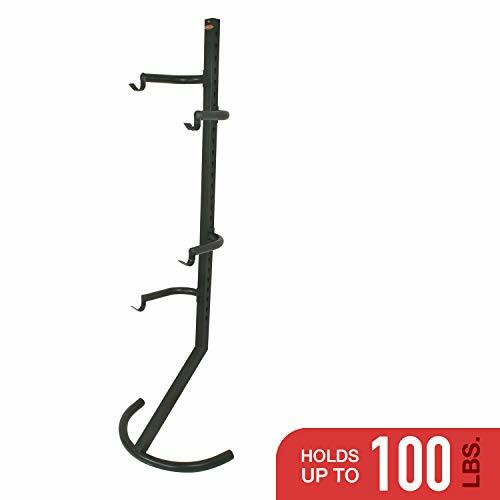 When positioned against (or near) a wall, the rack sways mildly when a bike is removed or replaced. The base is big enough and the overall design is such that removing the bottom bike (gently) doesn't seem to cause the whole thing to fall over--as long as the wall is there for backup. 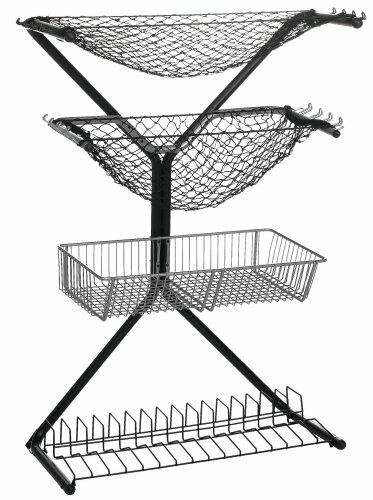 The manufacturer recommends anchoring the rack to the wall and includes hardware for this purpose. The central post is delivered in three sections: The base is the curved "T" that you can see in the picture on the Amazon site. The other two sections form the vertical tube. These main sections fit very tightly together. As far as I'm concerned, this makes the whole thing more internally stable. To assemble the central post, I relied on a many squirts from my trusty can of WD-40, some wiggling, gravity, and patience. Without all that, I would've been stuck (and the sections would've been too). The four arms that hold the two bikes attach into slots on either side of the vertical tube. I used a small block of wood to knock the arms in and out of the slots (I don't have a mallet, and it seemed like a hammer would dent/scratch the finish). Each bike is held by resting the top tube in cradles (at the end of each arm). The cradles easily rotate as needed to adapt to the angle of the top tube. Nice touch. It definitely took some effort to put this rack together. However, I'm pleased with the results so far. It really frees up space! Taking it apart will be an interesting challenge some day. Is it worth the price? Well... Even with the Amazon price, it seems a bit more expensive than other garage-quality bike racks. However, over the years I've spent more in total on other racks that didn't work out for me at all. This one is just what I wanted! The pieces would not fit together, after hours of trying lube, force and then the hammer, nothing worked. One of the tubes finally split and now there is no hope of making it work. It seemed like a good idea, but I was just taken for $60.00. What I like about this stand is that it's sturdy. Also, the size is pretty good for standard bikes. The wheels don't fit in the "alternate direction" either, due to insufficient clearance between the arch of the U and the rear base tube of the rack. I received my Racor PBS-2R bike rack today and was quite disappointed the minute that I opened the box. The rack was shipped in its original packaging and the box was mildly beat up. Most of the hardware was floating around in the box not in the bags like they should have been. Most of the pieces were scratched as well. Once I started putting it together I realized that I had two left U's. Flipping over one of the U's works, but the screws will no longer be recessed like they should be. It works, but I am not the only person to have this problem. There are other people who have complained about the same problem here on Amazon. After reading the other reviews I decided against ordering two, and ordered only one to be safe. I am glad I did. I won't be ordering the second one unless they improve their Quality Control. I had the same issue as another reviewer - the same "U" brackets (i.e. two "left" brackets) - I called the company - this is intentional (probably to save money). You will need to use two longer screws for one of the "U"s and two of the shorter ones for the "U" with the recessed holes (none of this makes sense now - but it will when you put it together). But it will fit together. Once done - it works great - holds my Specialized Rockhopper very firmly - and looks good (second bike - no problem). For the money (29.99 at amazon plus free shipping) - was best price around. Can't rate the product 'cause I can't put it together. Box was not taped for shipping and arrived without the bag of hardware. If you're going to buy one, find one in a store if you can and inspect it carefully before taking it home. Shame on Amazon. We have four bikes - 2 adults and two kids. So, I bought two stands, and they work great. I turned it around for the kids' bikes and put the front tire in first. We have had no problem with them falling over. Even my four-year old is putting his bike away now! I was very tired of tripping over bikes - its nice to (1) have a way to keep the bikes upright, and (2) have a desginated place to park them. Bonus - two scooters fit nicely in the front side of the kids bike rack - we just leaned them two opposite ways, and they stay fine. 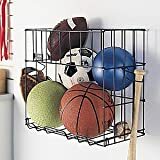 4 levels of storage-balls, bats, shoes, skates, etc. Holds two bikes in a compact space. 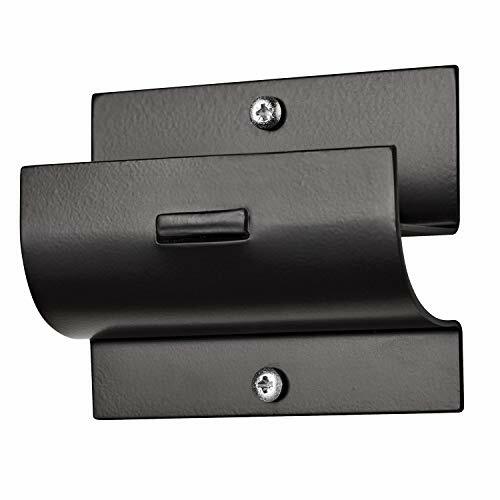 No bolts, screws, or fasteners required! Independent adjustment arms for level bike storage. Epoxy-coated black finish for long lasting use. Protects both door and wall.